Can we train dogs to bother robots instead of people? A robot is a dog’s best friend. Domestic dogs most likely diverged from wolves around 32,000 years ago. And they’ve been stealing sandwiches, digging through trash, and sniffing our crotches ever since. But new research out of Hungary shows we may be able to pawn the beasts on robots, so long as the machines faintly resemble a human being. To be clear, robot doggie care was not the goal of the research published in this month’s issue of Animal Cognition. The Hungarian researchers merely wanted to see if dogs would respond to cues given by robots if it meant finding food—in this case, a small piece of frankfurter. 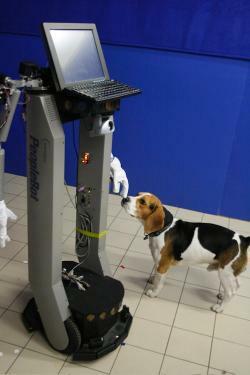 Moreover, they hypothesized that dogs would respond better to a social, humanlike robot than a robot that behaved like a machine. To test this hypothesis, researchers set up an experiment using a PeopleBot that basically looks like a laptop with arms. For one group, the robot was social, which meant it communicated with the dog’s owner using a woman’s voice and shook the owner’s hand. Since previous studies have shown animals to be capable of triadic interactions, or eavesdropping, the researchers suspected that the dogs would learn something from watching their owners interact with the strange contraption. (Triadic interaction is why my wife and I have to spell out “W-A-L-K” and “O-U-T-S-I-D-E” in the presence of our mutts.) Conversely, the asocial robot got the dog’s attention using beeps and when the owner reached out to shake its hand, the robot just ignored it—which must have been awkward for everyone involved. Dogs may even prove to be valuable, unbiased assets for robot engineers, since animals don’t carry all the cultural baggage that human test subjects do. Perhaps in the future cats will also show promise for interaction with robots. After all, they sure don’t want anything to do with us.